Products ads include custom images from your own product catalogs (created in the Bing Merchant Center), plus specific promotional text, pricing, and seller details. 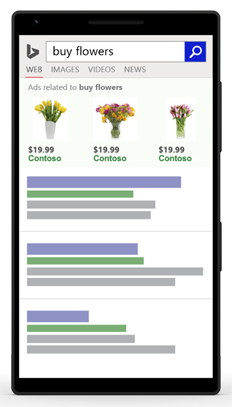 Bing Ads provides two types of ads: text ads and product ads. This article describes product ads. Products ads include custom images from your own product catalogs (created in the Bing Merchant Center), plus pricing and seller details. A title to the product ads block is also included, helping to bring attention to your products. Product ads use your specific product information to determine who sees your ads. 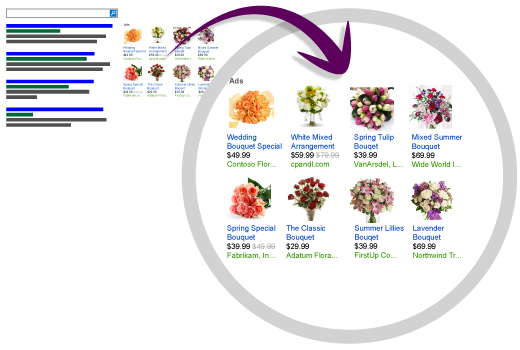 If someone's search query is relevant to your products, your product ad can show up on the search results. This rich visual presentation helps catch a search user's interest, and helps them make purchase decisions even before they click your ad. This can translate into greater engagement, higher click-through rates, and higher conversion rates. The process for creating product ads is slightly different than what you might be used to when creating a text or mobile ad. Be sure to read this article to learn how to get going. Bing Shopping Campaigns and product ads are available only in the United States, United Kingdom, Australia, France, Germany, India, and Canada (English only and excluding Quebec).